Speed Pitch Interactive – Nothing creates victory like the highest number. Whether you have a birthday to celebrate, a special event, or corporate get together, the About to Bounce Speed Pitch Interactive is the perfect piece of entertainment for your guests. Inside the Speed Pitch Interactive, in an area of 20' x 20', a radar gun will quickly measure how fast you hurtle the baseball at the target. Have your guests lined up one by one to take their chances and nailing the high score, or, if you have a couple guests that think they have pretty good throwing arms, have them go head-to-head with back to back throws and let the crowd roar. If anyone at your party or get together has a perfect arm, this will be the game for them to show it. 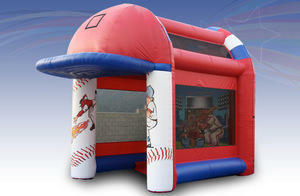 Priced at $253 for a five hour rental, you can get more innings than the World Series and your party, with the About to Bounce Speed Pitch Interactive.